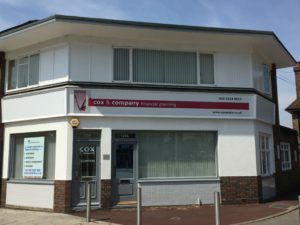 Cox & Company Financial Planning is a business with strong family values, based in the heart of Waterlooville – and the advisers, Simon Cox and Tim Linford, have between them provided financial advisory services to individuals, families, trustees and businesses for over 30 years prior to the establishment of this practice in 2015. You may have been looking for a local financial adviser without success and possibly finding it hard to find an approach that exactly suits you. As we always offer a complimentary free initial consultation, this provides you with the opportunity for you to meet and chat with one of our financial advisers – thus ensuring you “try before you buy”! The most important factor is clear understanding and communication between you, the prospective client, and us, as your potential advisers. If you cannot find what you are looking for, please get in touch and we will let you know if we can help.